Stamped Sophisticates: Lovely Lace Embossing Folder from Stampin' Up! I used a technique of inking the Lovely Lace Embossing Folder with a brayer before running it through the Big Shot to create this card. Then I added the May Flower Framelit flower over the top of the brayerd image. The card was difficult to photograph. It came out looking like a shade of Peekaboo Peach rather than Pink Pirouette. 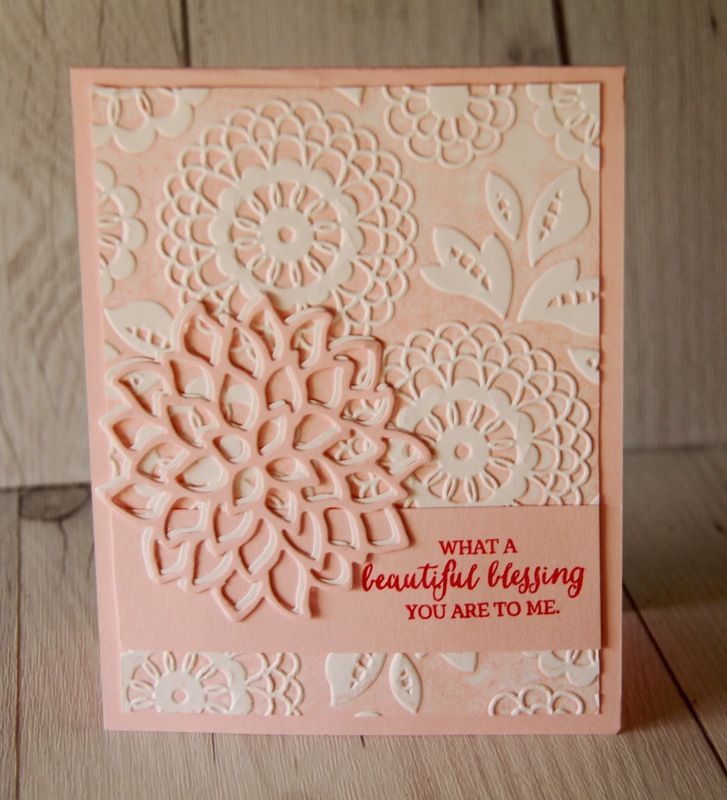 The color is actually Pink Pirouette with the sentiments stamped in Mellon Mambo. I originally tried Basic Black, and then I tried Rose Red for the sentiments, but Mellon Mambo was my final choice with Pink Pirouette images. Basic Black overpowered the card and Rose Red seemed too faded. Mellon Mambo added just the right amount of pop. 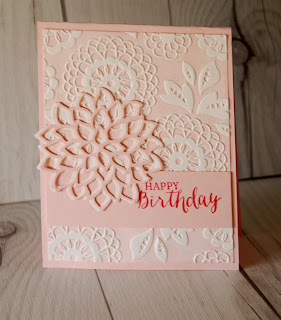 I used three different sentiments, all from the Rose Wonder stamp set. 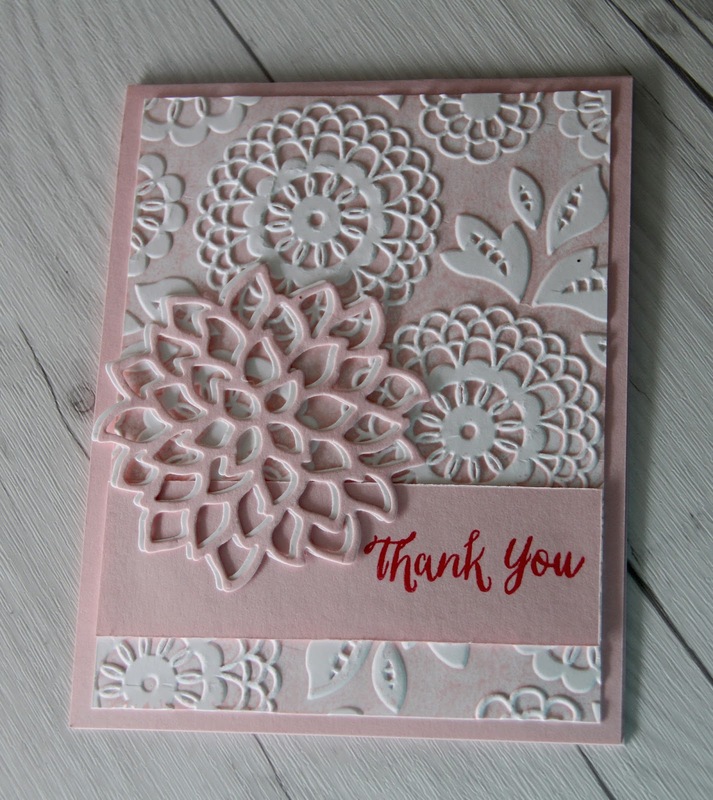 I also cut both a Whisper White and a Pink Pirouette flower using the May Flowers thinlit die, and then offset the white underneath the Pink Pirouette layer to give the flower a bit of dimension. Without the Whisper White layer, the flower seemed to blend into the background image. This photo (above), shot at a different angle than the other cards captured the true Pink Pirouette colors of the original card best. Click for a larger image to see the details in the double flower. Here is a shot of all three cards together. Depending on how the light hits each card, you see different shades from Peekaboo Peach to Pink Pirouette, even though all three are the same Pink Pirouette. This is shot in nature daylight. Anyone else have difficulty photographing Pink Pirouette? Updated items on the Clearance rack are up to 60% off. New items have been added, including some of the wonderful retired Photopolymer stamp sets that Stampin' Up! used to sell as a test before adding Photopolymer sets as a permanent offering in the yearly Stmapin' Up! catalog. Check out the items at great prices as they are only good until gone! Items include several Halloween and Christmas items. See items here. 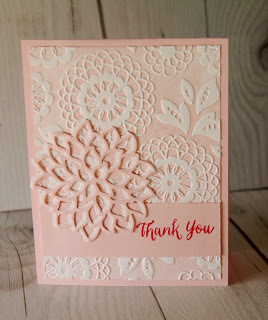 Download a copy of the Stampin' Up! 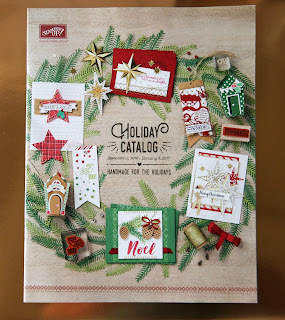 Holiday Catalog for free! Down load a free copy of the catalog. 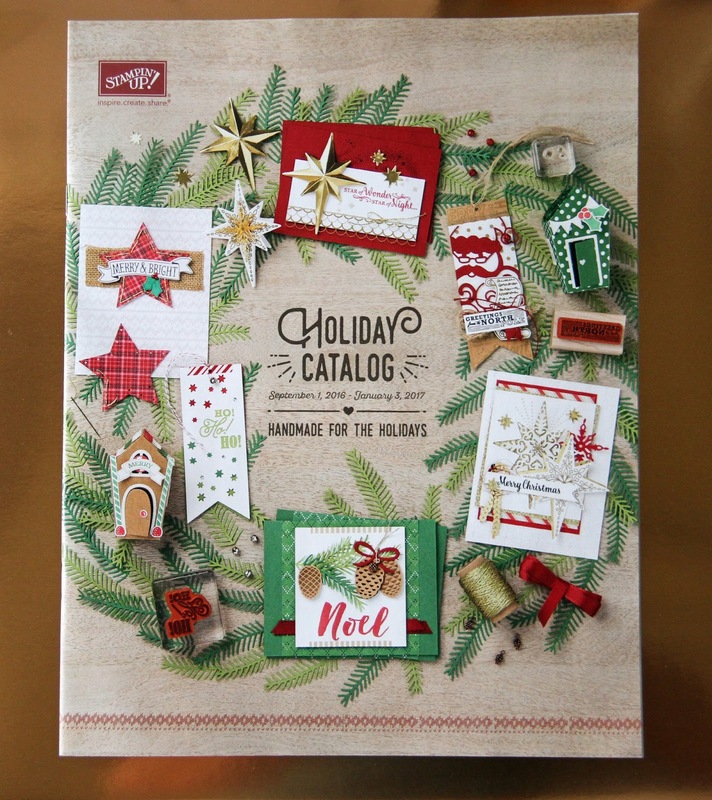 Use it for ideas and inspiration for your holiday projects. 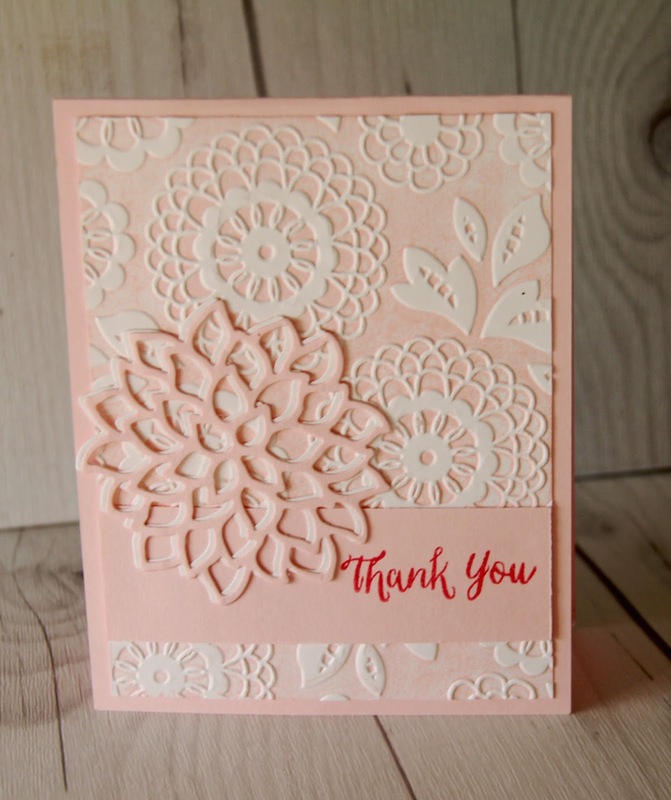 Consider joining Stampin' Up! if your Wish list totals more than $99. Join Stampin' Up! and receive $125 worth of stamps and products for the holidays and hand make your Halloween, Thanksgiving and Christmas cards while having fun with your friends as a Stampin' Up! demonstrator. Hobby demonstrators can get in on this $99 special and then receive discounts on your future purchases over $150. Paper Pumpkin kits include papers, inks, and stamps to make a different projects each month. Offer invalid if subscription is suspended or cancelled during the first two months. In other words, subscribers cannot cancel or suspend their subscription during their first two months—if you do, the offer is void. You can put your subscription on hold or cancel after the first two full months.